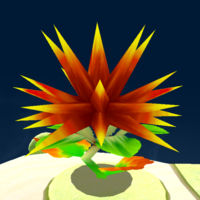 Giant prickly plants appear in Super Mario Galaxy and its sequel, behaving just like their smaller variants, and can be destroyed the same way. They are seen in the Good Egg Galaxy and Dusty Dune Galaxy. They reappear in Mario Party: Island Tour, where they are only found in the minigame Goomba to Maneuver. Due to them being larger, this makes them harder to avoid. ↑ Black, Fletcher. Super Mario Galaxy PRIMA Official Game Guide, pages 202 and 207. This page was last edited on March 2, 2019, at 23:35.